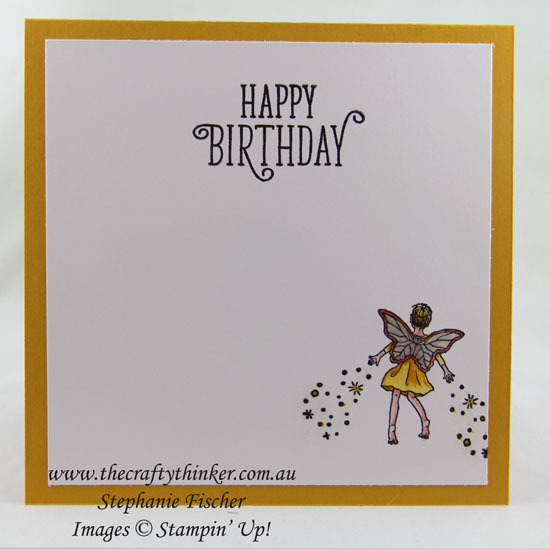 This lovely fairy is from the continuing stamp set "Fairy Celebration"
Crushed Curry, Calypso Coral, Pear Pizzazz, Old Olive, Sahara Sand, Soft Suede and the new In-Colour Powder Pink. Although it doesn't show in my photo, unfortunately, there is a layer of Wink of Stella on the fairy's wings so that they shimmer. I left the background white to match with the DSP in the background. 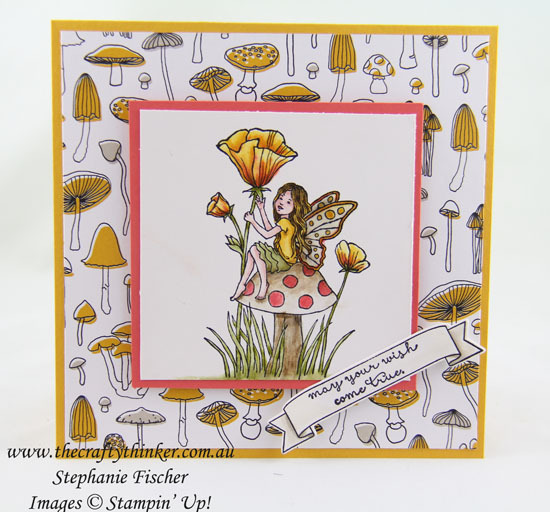 The fairy panel is layered onto a piece of Calypso Coral and then adhered to the card front with Stampin' Dimensionals. I stamped the greeting (from Fairy Celebration) and banner (from Number of Years) with Basic Black ink and cut it out with the matching die from the Large Numbers Framelits. I used Sahara Sand ink to watercolour the banner ends to give shading to the folds. Then I attached it to the card front with a double layer of Stampin' Dimensionals. I think this greeting from the new Happy Birthday Gorgeous stamp set will be my new "go to" birthday greeting! The little fairy inside the card was stamped and watercoloured in the same way as before. I added Wink of Stella to her wings and also to the areas around the "magic". Unfortunately, the lovely shimmer isn't showing in my photo. The greeting is from the new stamp set Happy Birthday Gorgeous.